The Kinta Series comprises Choong’s range of works in the 1960’s. He described it as a “period of exploring, experiment and searching”. 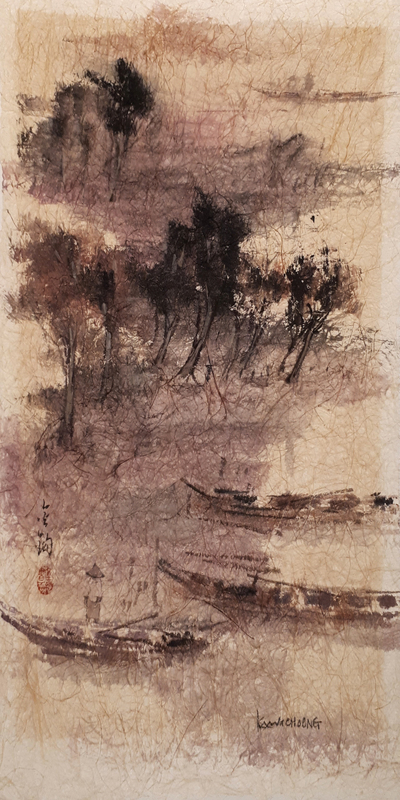 He channelled his inspiration from art masters such as Chen Wen Hsi, Cheong Soo Pieng and Zao Wou-Ki to produce the series, working with oil, watercolour and Chinese ink via expressionistic art approach. It was a time in which he narrated a story of his childhood, depicting scenes of villages and tin mines in Perak. His choice of colours used for this series sets the nostalgic theme as he shares with his audience a part of his past memory. He brings forth a feeling of reminiscence with a gush of mystique and wonder to those who set their eyes on his pristine pieces. You can’t help but be in awe with the alluring way he strokes his brush and expresses his story with remarkable power and aesthetic impact. He successfully presents the contrasts and cohabiting between East and West, tradition and modernity as well as nature and humanity.